Police in Northern Ireland have used drones more than 370 times since June 2013. 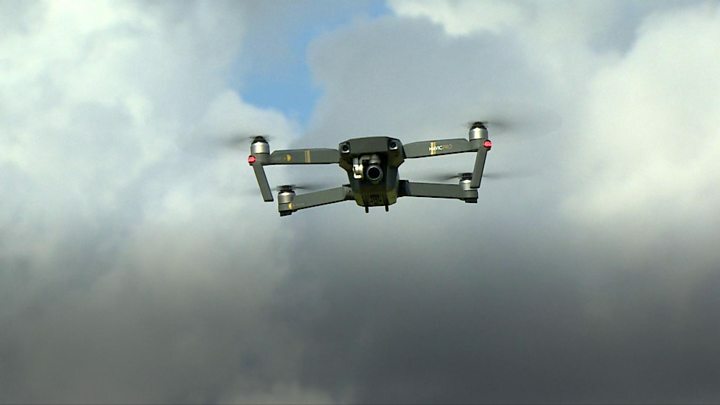 Figures obtained by BBC News NI show that the Police Service of Northern Ireland (PSNI) used drones in wildlife rescues, missing person hunts and VIP visits. The latest figures come as new rules make it illegal to fly a drone within 5km of a UK airport. There will be major penalties for those who break the law. There are five restricted zones across Northern Ireland - in Antrim, Londonderry, Down and Fermanagh. What good can drones do? From Wednesday, drone users can only fly within restriction zones if they have the correct permission from air traffic control or the airport. In December 2018, drones caused chaos at Gatwick Airport outside London. Flights were suspended for more than 36 hours after drones were reported over the airfield. Commenting on the latest changes to the law, UK Transport Secretary Chris Grayling said: "All drone users should be aware that flying a drone within 5km of an airport or over 400ft is a serious criminal act, one which could put lives at risk and risks penalties ranging from significant fines to a life sentence." The PSNI said the number of incidents involving recreational drones had "significantly increased" in recent years. Current regulations by the Civil Aviation Authority (CAA) require drones to be kept in line of sight and flown no higher than 120 metres. They must be at least 50 meters from buildings, vehicles or over large crowds. The PSNI also use drones - referred to as Unmanned Aerial Vehicles (UAVs) - as part of their police work. The PSNI Air Support currently owns three micro and three small aircraft UAVs. Figures obtained by BBC News NI under Freedom of Information legislation show that the PSNI has dispatched drones on 372 occasions since June 2013. They have been used to help search for vulnerable missing people and to provide support at a number of events, including the G8 Summit in Fermanagh in 2013. The PSNI must report to the Policing Board every six months on its use of drones. In its FOI response, the PSNI confirmed its figures do not include the "covert" use of drones. It said: "Confirming or denying the specific circumstances in which the police service may or may not deploy UAVs covertly, would lead to an increase of harm to covert investigations and compromise law enforcement. "This would be to the detriment of providing an efficient policing service and a failure in providing a duty of care to all members of the public. It is well established that police forces use covert tactics and surveillance to gain intelligence in order to counteract criminal behaviour."